It’s been an interesting summer for the financial markets, to say the least. There has been more than enough noise from China and Europe to last a lifetime. Needless to say, it makes it difficult to determine which sector ETFs to buy in July. Thankfully Greece has agreed to their creditors’ demands. They’ve once again kicked the can far enough down the road that it’s no longer impacting the financial markets. And fears that a bubble in Chinese stocks was about to burst have been put to bed as well. The Chinese government stepped in to stabilize their stock markets. In short, the Chinese government isn’t about to let the stock market fall apart. They’re already dealing with issues from slowing economic growth and problems in their real estate markets. As a result, investors are shifting their focus back to the US economic data and earnings season. Last week was a mixed bag for economic data. For instance, there were fewer jobless claims than expected, housings starts beat expectations, and industrial production and capacity utilization continued to accelerate faster than expected. But at the same time, the US consumer is showing signs of weakness. Economists were expecting the four month run of retail sales growth to continue in June. Instead, retail sales unexpectedly dropped. The data was disappointing even when stripping out the volatile auto sales numbers. Experts were expecting retail sales to grow 0.5% in June but they actually came in 0.1% lower than what they spent in the previous month. There are clearly some crosswinds in the US economic data that are creating uncertainty. And the earnings reports didn’t do much to change that opinion. We’ve seen strong earnings from internet companies like Google $GOOG and Netflix $NFLX. There was also some good news for the big banks like $BAC, $C, and $JPM that reported earnings last week. But Intel $INTC gave disappointing guidance, even though it wasn’t as bad as some had expected. And anything tied to an oil field is still looking for a bottom. Another thing to keep an eye on for buy signals is investor sentiment. Right now, most investors are sitting on the fence. They’re neither bullish nor bearish on stocks over the next six months. The AAII Investor Sentiment Survey shows 46% of investors are neither bullish nor bearish on stocks… an uptick of 3% from last week and well above the long-term average of 31%. These fence sitters are likely watching the price action of the S&P 500. Right now, the S&P 500 is back near the high end of its trading range near 2,130. One thing you’ll notice is that the S&P recently tested support of the 200-day moving average (MA). Right now, the 200-day MA is the most important support. 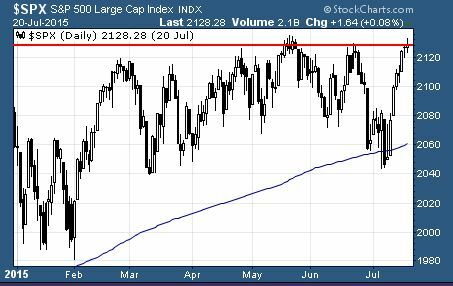 And the 2,130 resistance is the most important resistance level for the large cap index. A breakout through one of these technical levels will likely bring more traders into the market. We could see bullish or bearish activity accelerate quickly depending on which one of these technical levels gives way first. Recent history suggests that we’re more likely to see a bullish breakout in the near future.